Mylapore Social History Project initiated by Mylapore Times - the neighbourhood newspaper. 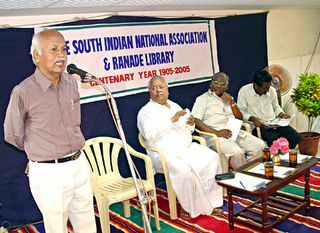 The centenary celebrations of South Indian National Association (SINA) and Ranade Library, both Mylapore institutions, were held on June 2 and 3, 2005. One function was held at the GSI-K. N. Shanmughasundaram Hall in Karpagambal Nagar. SINA president A. M. Swaminathan is seen addressing the guests.